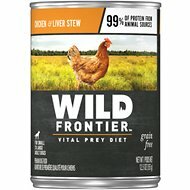 Feed your furry best friend’s natural desire for meat with Wild Frontier by Nutro Chicken, Beef & Liver Stew Variety Pack Grain-Free Adult Canned Dog Food. 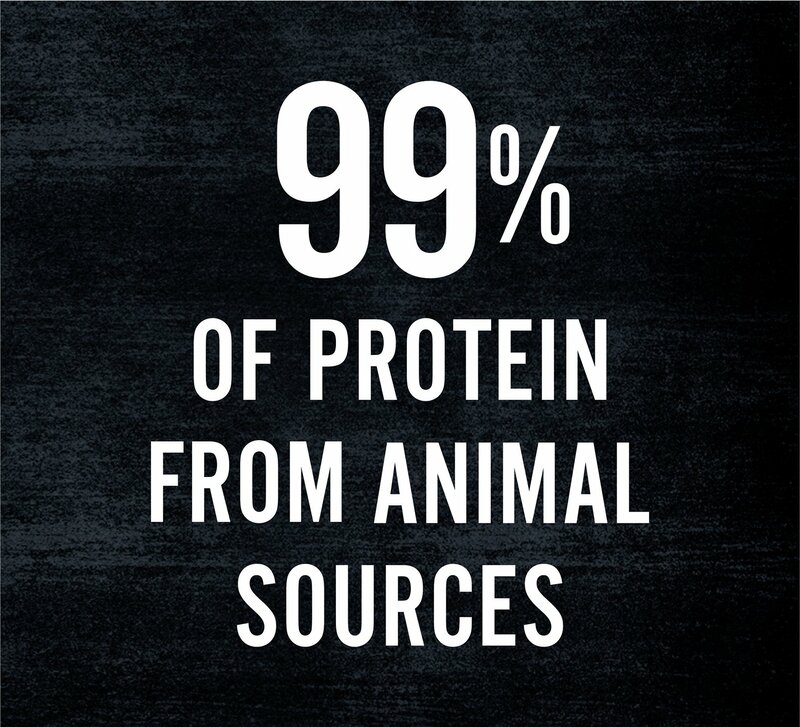 Made from protein-rich, animal-based ingredients—inspired by your dog’s ancestors’ eating habits. 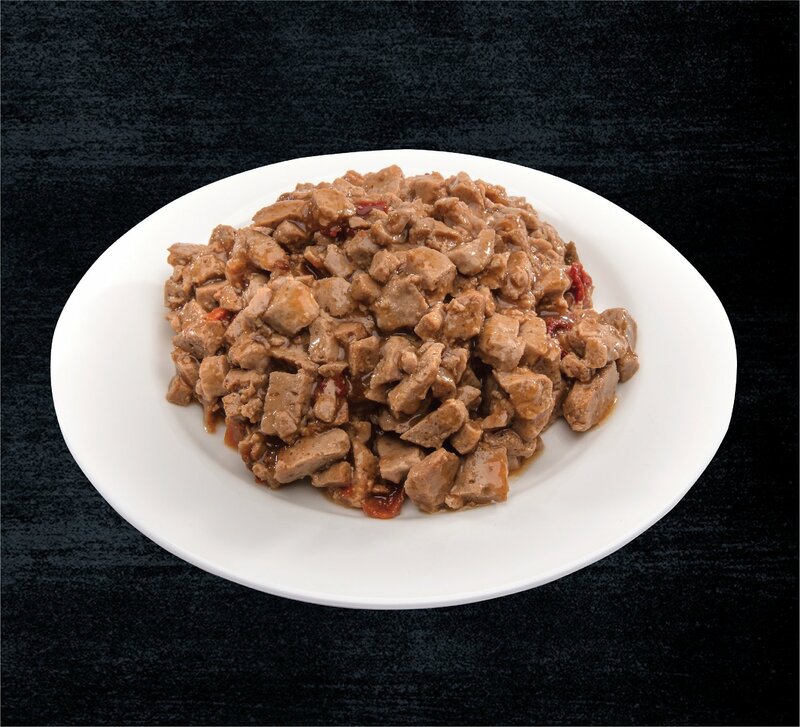 These canned dog food recipes are filled with nutrient-rich organs, such as liver for a good source of vitamin A, iron, protein and essential amino acids that contribute to your pal’s healthy vision, muscle development and maintenance, and immune system health. The complete and balanced grain-free formula is designed to support strong, lean bodies and promote healthy skin and coats. True to the hunt, Wild Frontier is what your dogs want. 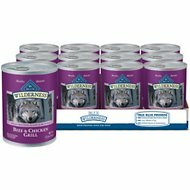 Variety pack canned dog food with excellent sources of protein and amino acids, plus a natural source of glucosamine for joint health and mobility. 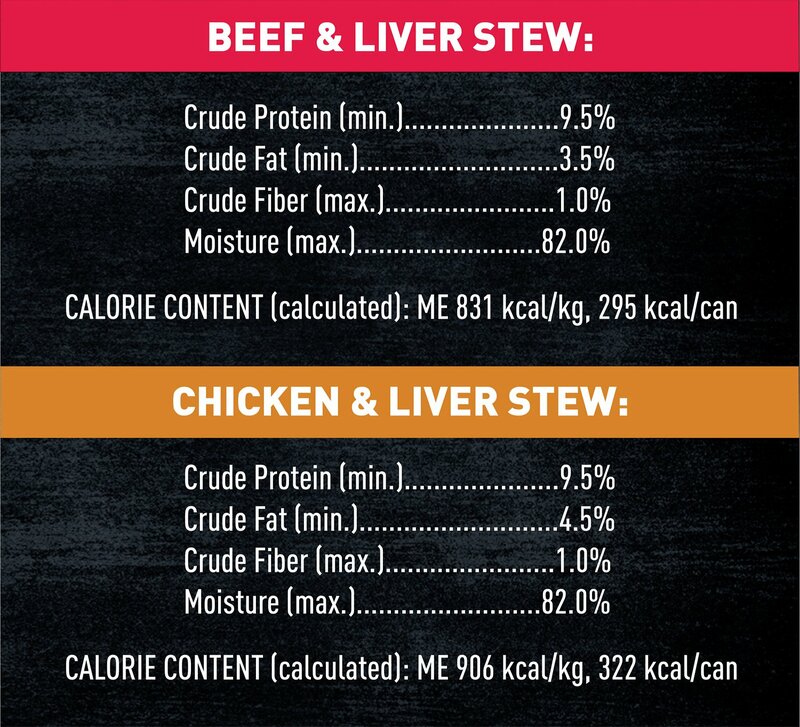 With 99% of protein from animal sources, this high-protein dog food stew satisfies your dog’s natural desire for the hunt. Contains nutrient-rich organs for your pal’s strong muscles, bright eyes and vision and a healthy immune system. Grain-free dog food formulated for a complete and balanced diet that supports strong, lean bodies and promotes healthy skin and coats. 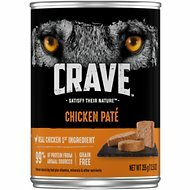 This premium canned dog food stew has no corn, wheat, soy, artificial flavors or preservatives, so you can feel good about serving it to your pal. Beef & Liver: Chicken Broth, Beef, Liver, Chicken, Potato Starch, Dried Egg Product, Dried Pork Broth, Calcium Carbonate, Natural Flavor, Sunflower Oil (Preserved with Mixed Tocopherols), Salt, Dried Peas, Dried Carrots, Guar Gum, Dried Tomatoes, Potassium Chloride, Sodium Acid Pyrophosphate, Tetrasodium Pyrophosphate, Tricalcium Phosphate, Xanthan Gum, Sodium Hexametaphosphate, Ferrous Sulfate, Choline Chloride, Magnesium Sulfate, Zinc Oxide, Vitamin E Supplement, Copper Proteinate, Manganese Sulfate, Sodium Selenite, D-Calcium Pantothenate, Thiamine Mononitrate, Potassium Iodide, Vitamin A Supplement, Vitamin D3 Supplement, Vitamin B12 Supplement, Pyridoxine Hydrochloride, Riboflavin Supplement, Biotin. Chicken & Liver: Chicken Broth, Chicken, Liver, Potato Starch, Dried Egg Product, Dried Pork Broth, Calcium Carbonate, Natural Flavor, Dried Tomatoes, Sunflower Oil (Preserved with Mixed Tocopherols), Salt, Dried Peas, Dried Carrots, Guar Gum, Potassium Chloride, Sodium Acid Pyrophosphate, Tetrasodium Pyrophosphate, Tricalcium Phosphate, Xanthan Gum, Sodium Hexametaphosphate, Ferrous Sulfate, Choline Chloride, Magnesium Sulfate, Zinc Oxide, Vitamin E Supplement, Copper Proteinate, Manganese Sulfate, Sodium Selenite, D-Calcium Pantothenate, Thiamine Mononitrate, Potassium Iodide, Vitamin A Supplement, Vitamin D3 Supplement, Vitamin B12 Supplement, Pyridoxine Hydrochloride, Riboflavin Supplement, Biotin. 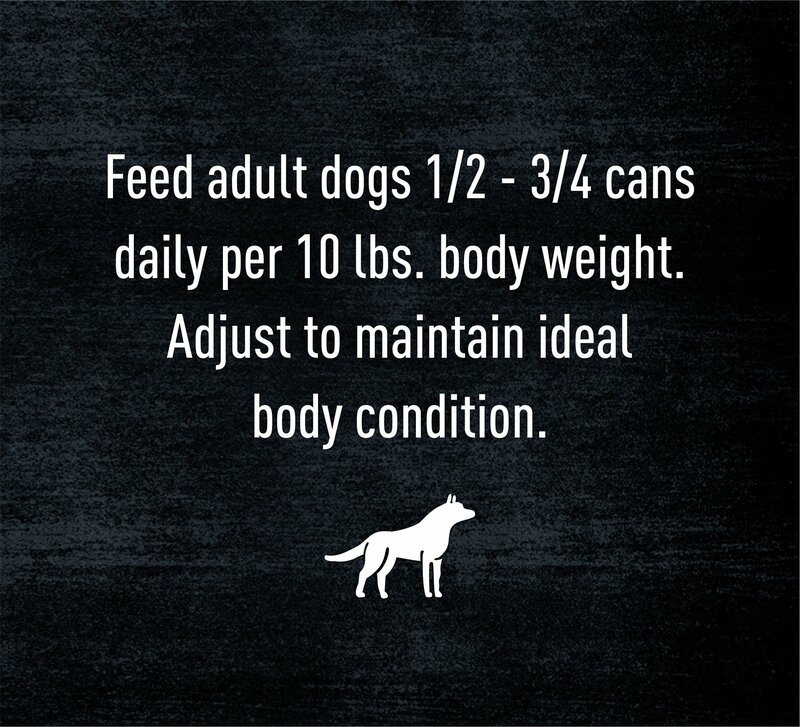 Feed adult dogs 1/2 to 3/4 can daily for every 10 pounds of body weight. Adjust to maintain ideal body condition. I ordered this food because they offered a 2 for 1 special. My dogs like it, and it seems to be a good quality product. Must be used for the all the animals in my case it is very useful to variant cases.